This past month I have spent a while reading literature about mental health. It was sparked off by the publication of the maginificent collection of essays edited by award-winning author, Jerry Pinto. 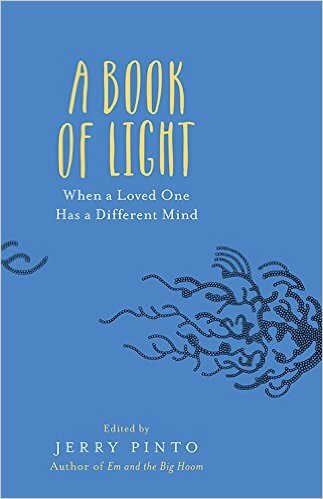 A Book of Light: When a Loved One has a Different Mind consists of essays written by caregivers to mentally-challenged patients. These could be daughter, mother, son, father or even a close friend. 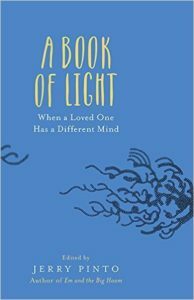 All the essays are written by a caregiver who is also part of the immediate family so has witnessed the painful deterioration of the loved one. Some of the essays like Nirpuma Dutt on her adopted daughter though written using the literary device of an omniscient narrator is one of the most chilling and moving contributions. Every single essay stands out for the grief caused but also for the time and effort required in the caregiving which was mostly offered uncomplaingly and with total dedication. Amandeep Sandhu’s essay about his mother which I first read in draft many years ago continues to be powerful once published years later. As if this caregiving was meant to be. This was the truth. Jerry Pinto who won the Windham-Campbell prize in 2016 has been writing for years made his mark as a literary fiction writer with the splendid novel, Em and Hoom. A thinly disguised fictional account about his mother who remained in poor mental health for most of her life. It was twenty-six years in the making. Despite the vast variety of literature across genres and now his forays into translations, Jerry Pinto is at his best when writing about mental afflictions. There is a certain tenderness and sensitive understanding that seeps through his essays as it does in the introduction to this book and his curation of the essays. Having read this splendid volume in one sitting I found some more books to read. For instance, Matt Haig’s powerful autobiography Reasons to Stay Alive. It is about his leading a perfectly normal life except to develop acute depression and have a nervous breakdown in his early twenties. He even attempted suicide but then slowly recovered with the help of his then-girlfriend and now wife, Andrea, and his parents. Today, he is a successful author for children and adults and is a social media influencer ( @matthaig1) . When you are trapped inside something that feels so unreal, you look for anything that gives you a sense of your bearings. I craved knowledge. I craved facts. I searched for them like lifebuoys in the sea. …Things that occur in the mind can often be hidden. Indeed when I first became ill I spent a lot of energy on looking normal. People often only know someone is suffering if they tell them, and with depression that doesn’t always happen, especially if you are male ( more on that later). Then I discovered bestselling author Jenny Lawson’s Furiously Happy that explores her lifelong battle with mental illness. It is written at a pitch that can get disconcertingly high, it is not easy trying to keep pace with the ups and lows in her life which are surpringly palpable in the text as well. But what truly shines through is the struggle of managing daily life and yet how determined she is. Simple things are daunting but the unimaginable fear she experienced when recording her audiobook turned her into a nervous wreck. So she finally turned to her friend, Neil Gaiman, for advice and this is what he texted her: “Pretend you’re good at it.” She took his advice to heart and shone. Reasons to Stay Alive and Furiously Happy are two books written from the perspective of people who struggle with mental ill-health but have had the courage to write about it too. Offer an opinion that does not consider them over sensitive, peculiar and odd. 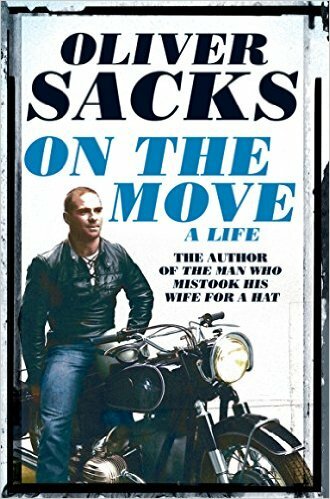 And then I read Oliver Sacks absolutely stupendous memoir On the Move. It was first published in April 2015 a few weeks before he succumbed to cancer on 30 August 2015, exactly a year ago today. In fine literary form it reflects upon a richly memorable life that spans eight decades focusing on his fascination with neurology, science, music, literature and his strong links with his family. Oliver Sacks came from a family of doctors where even his mother was a renowned surgeon. 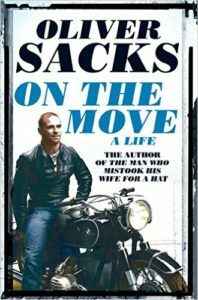 His father and two elder brothers were general practitioners but Oliver Sacks decided to become a neurologist. What is extraordinary is his recognition that when he began medical school in the mid-1950s there seemed to be an unbridgeable gap between neurophysiology and the actualities of how patients experienced neurological disorders. Neurology continued to follow the clinico-anatomical method set by Broca a century earlier, locating areas of damage in the brain and correlating these with symptoms; thus speech disturbances were correlated with damage to Broca’s speech area, paralysis with damage to motor areas, and so on. But by the mid-1980s scientists like Gerald M. Edelman were stating boldly that “We are at the beginning of the neuroscience revolution.” Having witnessed, documented and analysed significant neurological milestones writing about them in medical journals and popular magazines made him famous. It probably also helped recognise to some degree that mental ailments need to be discussed. Mentally ill patients are not pariah. Having firsthand experience of looking after a schizophrenic brother and extremely fond of a simple-minded aunt, a treasured member of their household he had a warm and sensitive generosity evident in the way he dealt with his patients too. More importantly he had a sense of history and an understanding to document what he experienced and analyse it. A rich and influential legacy he left on the way mentally-ill patients are perceived and how they can also learn to manage themselves. But at least he with his passion for neurological science made it possible for mental health to be made visible in public discourse. Otherwise how else would a well-known scientist and Pulitzer-award winner Siddhartha Mukherjee begin his fascinating account of the gene with a very personal account of his schizophrenic uncle?